Gold is the key commodity to gauge the health of the overall mining sector, and there are many ways to play its trend. For example, in the late 1970s it was big news as gold doubled to $850 an ounce. Silver barely got mentioned but was the better precious metals play, rising more than six-fold over the same period to $50 an ounce. My preference has always been silver over gold, and still is. More on the Gold/Silver Ratio in our newsletter: Is Silver Set to Rocket Higher - much more than gold prices, in percentage terms? I'm also looking into why platinum now trades at a discount to gold, because for decades platinum always traded at a premium to gold. Beyond its rarity and many uses, gold is a special benchmark because of its traditional value as money. Gold's relatively stable time-tested value is why the expensiveness or cheapness of so many things is still determined by many as how much something really costs in gold - most notably for oil, currency and the stock market in general. Is Gold Expensive Compared To The Stock Market Right Now? Long-term market cycles, ratios, Fibonacci Retracements and other technical trends can guide investors about where they are, and what might reasonably be expected next. I'm not talking about a trader's short-term trend-lines, but rather zooming out to more easily identified multi-year to decades-long historical boom and bust mega-cycles. Wall Street's three value mega-cycles over the past century are easily identifiable. All three have lasted several years to over two decades. Within each of these mega-cycles there have been multiple bull and bear market corrections that have lasted months or longer. The tricky part is identifying these short-term gyrations, and staying with the overall mega-cycle versus closing out too soon. Every stock has its own fundamental values, but what I am referring to is a stock market's overall relative value to gold. 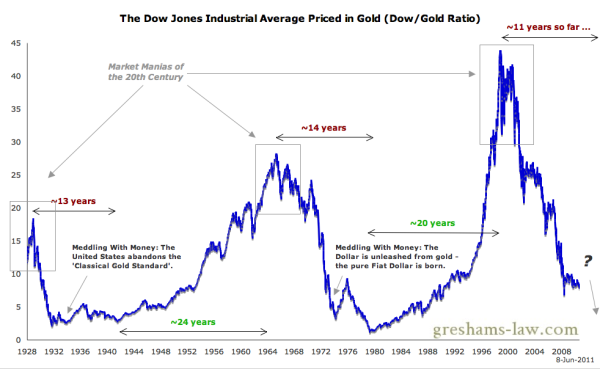 The following chart shows the value of the Dow Jones Industrial Average priced in ounces of gold. The peaks and valleys on this chart correlate fairly closely with past tops and bottoms of the stock market, but more importantly they indicate how cheap or expensive the market might be at any time versus gold. The top of the first DJIA value mega-cycle was in September 1929, when it took over 18 ounces of gold to equal the point value of the Dow. Four years later the Dow/Gold Ratio bottomed in February 1933 at less than two. The next value mega-cycle didn't peak until 35-years later in February 1968, at over 28 ounces of gold. It then took 12-years to find a relative value bottom in February 1980 at very close to one. This started the next mega-cycle that lasted until February 2001 at over 42 ounces of gold to buy the Dow. Using these relative Dow/gold ratios to predict stock market tops seem unclear, as the last three tops were never the same at over 18, 28 and 42 ounces of gold. However, perhaps these higher and higher top values could have been predicted if the proportional lowering and lowering of money's backing by gold over time had also been factored in. It's also interesting that just before the so-called market crash in October 1987, when the Dow dropped almost 1,000 points from peak to trough, that the Dow was valued at only five ounces of gold. This is not expensive compared to previous mega-cycle tops. Instead of panic selling in fear of the end of a major bull market, as many pundits believed, even if you had bought the Dow at the highest point in 1987, by 2000 its value had more than quadrupled. Most economists have relabelled the 1987 crash as just another correction. Is Gold's Sell-Off From $1,900+ Last August A Mega-Cycle Top, Or Another Correction? At 13,000 the Dow is now barely above its level a decade ago, while the price of gold has increased more than fivefold from under $300 to over $1,600 an ounce currently. Surely gold's value mega-cycle has topped, and the stock market's value mega-cycle has bottomed and is ready to roll again? Not yet - if history repeats again this time! The most interesting observation from the chart above is that before these mega-cycles end, the Dow and the price of gold reach close to parity. The current Dow/Gold Ratio is 13,029/1,642 = 7.93, suggesting the current gold value mega-cycle still has a way to go. For the Dow/Gold Ratio to equal parity today, then either the price of gold has to rise to $13,000 an ounce, or the Dow falls to 1,600 points, or they meet somewhere between. This is not a prediction, just an interpretation based on past behaviour. However, several gold experts have been suggesting much higher gold levels are very possible before this mega-cycle ends. One such expert is Pierre Lassonde, a living legend in mining circles who used to run (NYSE: NEM) Newmont Mining, was Chairman of the World Gold Council, and is the current Chairman of (NYSE: FNV, TSX: FNV) Franco Nevada. Quoted from a recent KWN interview, Why Gold Could Spike 20% in a Day or Two, Mr. Lassonde states, "The mania phase is always the last phase of a bull market. I believe we are going to see that. I also believe it will mostly be of Chinese origin. Today over 50% of all of the gold sold on a yearly basis is sold in two countries, China and India. This is where it (the mania) will start. What can we expect? I think we can expect fireworks. The two previous bull markets in gold, 1980 and 1934, gold ended at essentially a 1/1 ratio with the Dow Jones and the Dow today is over 13,000. Would I be surprised to see gold past $10,000? No. I know it sounds crazy but it sounds a heck of a lot less crazy than it did five or six years ago." The interview also points to gold purchase trends by central banks and the public, and warns about potential conflict with Iran and the effects on the world economy, oil and gold prices. Here's a chart of the current gold mega-cycle from 2003, and in the upper left corner is the 1970's gold mega-cycle that ended in 1980. From the larger gold chart we see a gradually upward sloping bull channel remains intact. The smaller gold chart shows two similar bull channels, with a downward sloping market correction between them. The first point is that within any mega-cycle there could one or more bull market channels, with short-term downward corrections in between. The other point is the mania phase that Mr. Lassonde referred to. In the past these mega-cycles don't end until they go vertical at some point, as you can see happened in 1979 during the last gold mega-cycle. Nothing like this has happened yet! When the US Federal Reserve issues new currency and exchanges this for Treasury Bills, this creates more debt. Unless there are more real assets to collateralize this additional debt, then the value of the currency theoretically should go down to reflect the value dilution of the existing assets. Think of this like a 2 for 1 stock split. You will end up with twice as many shares, but each share is worth half as much - because its value is based on the same company and assets as before. Dollars are like shares in the USA Corporation and when you print more of them, each dollar is backed by less value than before. Slicing a pie into more pieces doesn't give you more to eat! Money is commonly valued in terms of the stuff it buys, other currencies, and in gold and other hard assets. You can't depend on the value of stuff, because money loses value as prices go higher. You can't depend on the value of other currencies, because their value is diluted in the same way as your own currency. Gold is rare and is universally accepted as real money, especially during times of crisis such as war, inflation or debt default. In addition to looking at the Dow priced in gold, and comparing the charts of the current gold mega-cycle to past gold mega-cycles, we can also look at the price of gold compared to US debt for any signs of a gold top. 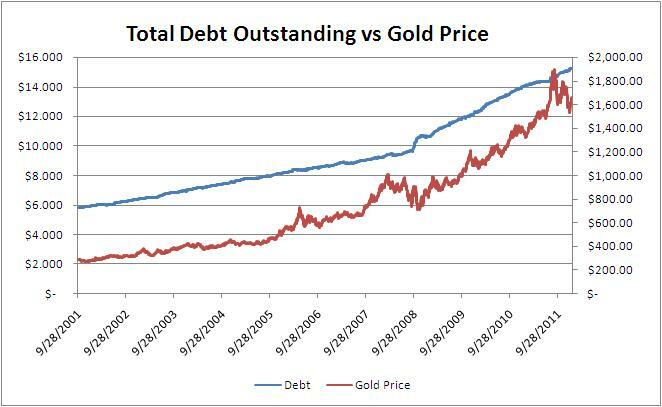 What catches my eye is that the debt slope and gold slope are about the same, as is the size of the gap between them. Notice how the lines touch each other last September, perhaps indicating that gold's price was slightly extended at that moment. This was around the time when gold eclipsed $1,900 an ounce but has since corrected. Gold's upward trend may continue for as long as US debt continues growing. Isn't there already talk about the debt ceiling being raised again this summer? If the stock market hiccups or the economy gets indigestion, does anyone really doubt the Fed will start the QE3 printing presses again - this election year?! The crossing of these lines again may perhaps mark the beginning of gold's mania phase? The next chart is similar and confirms how gold prices relate to the money supply on a worldwide scale. While it appears the price of gold has followed the same upward path as Total US Debt Outstanding and the Combined Global M2 Money Supply, this doesn't tell the whole story. Central banks are again buying gold to back their currencies, which begs the question at what price would gold have to be to equal the current value of the global money supply? At the end of 2011, the implied price of gold to back half of global money is over $5,000 per troy ounce. Fully backed, gold would have to rise to over $10,000 an ounce. Central banks continued the trend established in 2010 of being net buyers of gold. Purchases by central banks soared from 77.0t to 439.7t. This reflects the need to diversify assets, reduce reliance on one or two foreign currencies, rebalance reserves and ultimately protect national wealth. 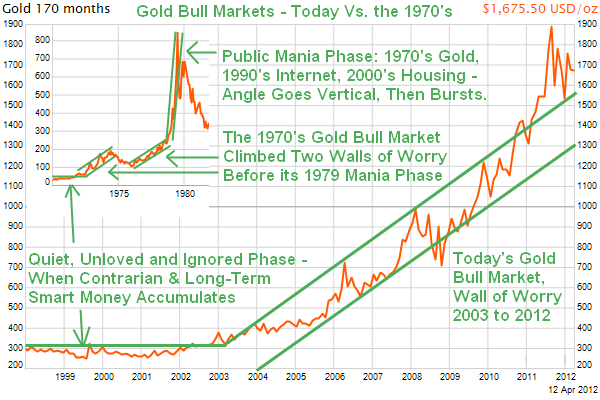 ..."
While the current gold value mega-cycle may have corrections from time to time, its uptrend appears well intact. If/when gold enters its mania phase is anyone's guess. For me, all of the above charts provide a rationale of why there's lots of room for gold to still go vertical, and where its top could be. Sign-up at InvestorsGuru.com (or blog.InvestorsGuru.com) for our Small Cap Stock Observer newsletter, and to set-up your own My Portfolio, My Watchlist & Alerts and News by Email preferences, or to post at our AnyTicker.com Bulletin Boards. Free!